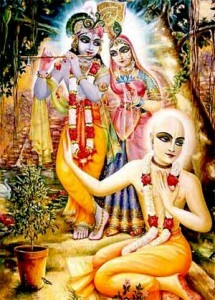 Radhanath Swami Question: In many spiritual discussions I have heard about the importance of Guru for a genuine spiritual connection. Can the guru be considered as God? Radhanath Swami Answers: When a drop of water falls from the cloud, it is transparent and pure but when it comes in contact with the dirt it becomes muddy. By filtering the water we bring it back to its natural state. Similarly, our consciousness is to love God but due to our connection to material nature contamination creeps into the consciousness. Spirituality simply means to filter our consciousness and bring it back to its natural pure state; that’s what the Guru is also helping us to do. We can’t hear God in our heart but a Guru has that connection with God and can help us also to make that connection. Guru is not God but God is coming through Guru to us. A proper Guru never asks us to have blind faith, but he asks us to have reasonable faith and he asks us to utilize our intelligence in understanding God. Once, someone asked my Guru, A.C. Bhaktivedanta Swami Prabhupada, “Are you the Guru of the whole world?” Srila Prabhupada humbly replied, “I am not anyone’s Guru but I am everyone’s servant.” This is the perfection and qualification of a Guru.